벤딩 및 스트레이트 기계는 200, 300 and 400 톤으로 구성 되어 있습니다. 기계의 수평적 디자인은 아주 긴 레일도 아주 쉽게 다룰 수 있게 합니다. 긴 스토롴크와 낮은 받침대 롤러는 작업을 아주 유용하게 할 수 있도록 도와 줍니다. 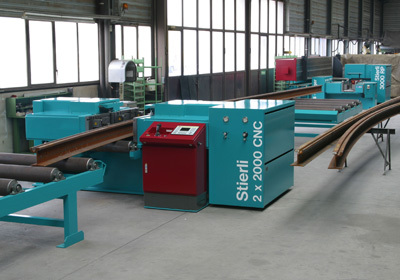 Through a long operating cable or a joystick the machine and roller conveyor can be served. The abutments are adjustable electro mechanically. The support plates with dove tail holding make possible an easy changing of the respective tools. The specially lubricated and guided hydraulic cylinder is maintenance free. 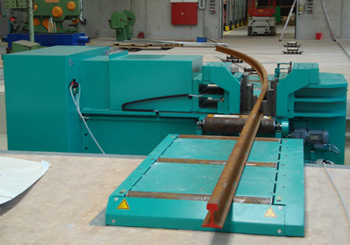 The working power is maintained throughout the stroke length with continuous maximum working speed.